If you want to go scuba diving Egypt then the entire coast of the Red Sea boasts ancient and elegant coral reefs, thick schools of exotic fish and sunken ancient ruins. The north-eastern coast features two amazing islands where you can drift find steep drops offs and you can drift dive along and ancient coral walls. You can also choose to go on special boat trips to view sunken ship wrecks that struck the Panorama Reef. The peninsula and south east coast of the Red Sea offer fantastic reefs within distance of the ruins and luxury hotels in the sophisticated metropolitan cities of Cairo and Luxor. 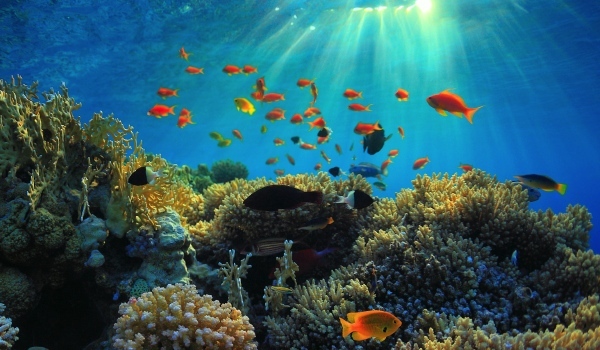 The Red Sea is home to over one thousand non-vertebrates as well as over 200 species of both soft and hard coral. It is also an amazing place to explore hundreds of ship wrecks and blue holes. Most of the fish in the Red Sea are unique. You cannot find the Red Sea endemic versions of dottybacks, triplefin blennies and butterfly fish anywhere else in the world. You will also encounter spectacular coral formations of both the Gorgonian and the feather-fan types. Every single type of coral reef is found in the Red Sea including walls, plateaus, lagoons, caves, gardens, shallow patch reefs and reefs that extend far into sea. Scuba diving the unique underwater terrain of the Red Sea is often compared to climbing up mountains and jumping off of them into the bottomless depths of the abyss. How to get to your scuba dive destination? The most comfortable way to travel to your dive destination within Egypt is to travel by bus. Your best choice for a bus company that circle the coast of the Red Sea is The Upper Egypt Bus Company. To go directly to diving destinations on the Sinai Peninsula take the East Delta Bus Company that goes back and forth from most major cities to the Sinai coast. If you want to dive at the famous Small Giftun Drift, be advised you can only get there by boat from the coast. If the wind is blowing from the North the water may be too choppy to accommodate a trip to the Drift itself. You can dive at any time of year in Egypt but in February the sea water temperature can drop to 22 degrees Celsius. The warmest waters can be found from June to August and reach 30 degrees Celsius. However the daily temperature is regularly 45 degrees Celsius which may affect your desire to travel during that month. If you want to see whale sharks the best time to go diving is between the end of May and the end of July. If you would like to be part of the sardine run, then the best time to go is between December and January. Giftun Island – This sandy island is surrounded by the coral varieties and mountainous reefs of the Small Giftun Drift. Panorama Reef – This is a long block of coral off Hurghada that swarms with eagle rays, turtles and hammer-head sharks. Seven Pillars – This diver’s paradise is on the beach of the Sheraton hotel in Soma Bay and is home to Napoleon fish, lizard fish and lion fish. The Wreck of the SS Dunraven – Off Sharm el Sheikh you will find the upside down hull of an 18th century wreck of a Bombay spice ship. The Wreck of the Thistlegorm – Off Sharm el Sheikh you will also find a sunken World War II cargo ship with locomotive cars and vintage motorcycles. There are four international airports in Egypt including ones in Hurghada, Cairo, Luxor and Sharm El Sheikh. All of these airports are served by EgyptAir which travels to most international cities globally. Although you can get to any area of diving in Egypt from any of these areas the Cairo, Luxor and Hurghada airports are closest to diving spots in the north and east. If you are planning to dive in the Sinai Peninsula area then you should opt to fly directly to Sharm El Sheikh.